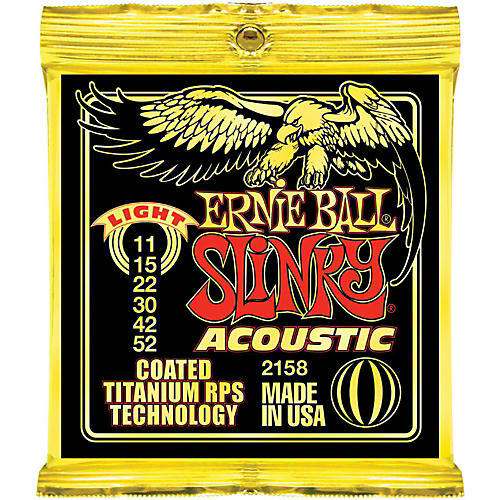 Ernie Ball Slinky Acoustic Guitar Strings feature patented coated Titanium RPS Technology that resists rust and grime for bright and powerful tone time after time. These titanium coated Slinky guitar strings are stronger and longer-lasting than traditional strings--either coated and uncoated strings. That's thanks in part to Ernie Ball's exclusive protective coating on both the wrap wire and the plain strings as well as a patented winding of titanium wire around the lock twist of the ball end. Staying true to Ernie Ball's heritage of superb craftsmanship and sound quality, the 2158 Slinky Acoustic Guitar Strings are made with the finest and freshest raw materials, resulting in a crisp ringing sound with pleasing overtones. Enhancing the inherent string quality and freshness is Ernie Ball's guitar string packaging. Produced and now hermetically sealed into their packages, Slinky Acoustic strings are exposed to minimal moisture and humidity from factory to retailer--insuring that all Ernie Ball strings are as fresh upon opening as they were the day they were made.